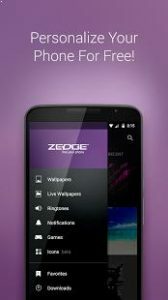 NEW: My ZEDGE™ lets you create a single log in to access all of your favorite wallpapers, ringtones and icons from any device. NEW: Themed collections including brand name wallpapers and home screen backgrounds from major movies and sport events. Enjoy popular Wallpapers for your home or lock screen from categories like landscapes, abstracts, inspirational quotes, sports, entertainment as well as live wallpapers and other images. Ringtones for every friend and family member including custom contact tones as well as your favorite music like rock, rap & country, plus comedy, sayings, and classic ringers and sound effects. Create the ultimate personal look for your phone with App Icons and Widgets to compliment your new home screen wallpaper. Browse Icon and widget themes including special edition versions for holidays, sports, movies, events plus colors, moods and more. Receive special limited edition holiday personalizations for every occasion from our most popular holidays like Valentines Day, Mothers Day, New Years, Halloween & Christmas plus cool customizations for birthdays, anniversaries, graduations, and more. Lots of ringtones and notification tones. The wallpapers are a bit limited but you can find just about any popular tone. I will create some and upload to keep the library vast and fun. Awesome, awesome, awesome! Love this app, every phone in the house has it.